Over a year after MoviePass failed to launch its all-you-can-view subscription movie service, the company is back with a retooled offering that has a much better shot at surviving the inevitable pushback by cinema chains and studios. You might recall last June MoviePass announced a private beta with 21 theatres in San Francisco that would allow subscribers paying USD $50 per month to watch an unlimited number of films in cinemas. In effect, the idea was to bring the Netflix business model to movie theatres. The companies plans were shelved however when theatre chains such as AMC and Landmark said they had no intention of working with MoviePass. 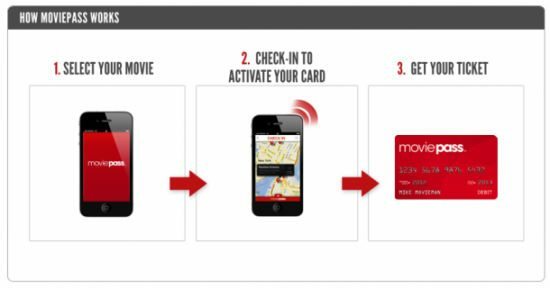 By July 2011 MoviePass had teamed up with Hollywood Movie Money to offer its members a similar service, provided they dealt with the inconvenience of printing vouchers at home which could then be redeemed at cinemas. Theatres would in turn be paid for each ticket, in-full, with MoviePass swallowing any price difference. At best, this was a cumbersome process which did not seam ideal for wide adoption. MoviePass has since parted ways with Hollywood Movie Money, dumped its voucher scheme and earlier this week made public its latest unlimited viewing subscription model. This time, MoviePass may have come up with a system that cinema owners and studios won’t balk at and its customers will find more attractive. Now, members pay between USD $19.99 and USD $34.99 per month and can watch up to one movie in theatres per day. The subscription price is determined on where a member lives. MoviePass has created three zones; those living in areas where ticket prices average less than USD $10 will pay USD $19.99 per month, whereas in high density markets such as New York or Los Angeles, where ticket prices average USD $14, members will pay at the USD $34.99 level. The new MoviePass service does come with a few restrictions. For instance, 3D and Imax films are not included as part of the monthly plan. As well, one can’t just subscribe to peak moviegoing months such as summer or the year-end holiday season. By using an ideal blend of technology, existing payment infrastructures and long standing business models, MoviePass has a much better chance of succeeding with its current offering. Mobile phones help the company track where their members are through geolocation, preventing fraud and abuse. The barrier for theatre owners to adopt the program has been lowered substantially since the MoviePass debit card works on whichever credit card system is already installed in the cinema. Major industry stakeholders (i.e. studios and cinema chains) should have little, if any, objection since they will be paid the full price of any ticket purchased using a MoviePass debit card. A MoviePass subscription is obviously not meant for the casual moviegoer who makes it to a theatre once every six months. Instead the company seems to be aiming for the kind of frequent moviegoer that the Motion Picture Association of America reports make up 10% of theatrical audiences but 50% of all ticket sales. This highlights would could be a problem for MoviePass, especially if their subscribers take advantage of the “unlimited” aspect of their subscriptions. Netflix worked under a similar philosophy when it was solely a DVD-by-mail subscription service. In fact, Netflix discovered early on that if any of their subscribers rented more than four DVDs in a single month the company lost money. So, they lowered the number of DVDs a subscriber could have out at a given time to three and “throttle” delivery to their heaviest users. I have always liken the type of business model MoviePass is undertaking to that of a gym or fitness center. On average health clubs take on 10 times the number of memberships their facilities can accommodate. They not only assume their members won’t all show up at once, they count on it as as a part of their business plan. The goal is to sign up as many infrequent exercisers as possible to recurring monthly memberships. Even better is that most members put their monthly dues on a credit card or have them deducted directly from a bank account, rarely seeing the wasted expense firsthand. The model is a perfect example of behavioral economics, a field of study made popular by the 2008 book Predictably Irrational by Dan Ariely. What this means is that to make a profit, for every MoviePass subscriber that over-uses the offering, the company will need at least one, preferably two or three, that under-utilize it. Presently MoviePass is in an invite only beta period and has 75,000 potential subscribers on its wait-list. The company is based in New York City and according to VentureBeat has raised USD $4.7 million in venture funding from the likes of AOL Ventures, True Ventures and WME. You can sign up for an invite to MoviePass by visiting http://movi.ps/UG2eiF.